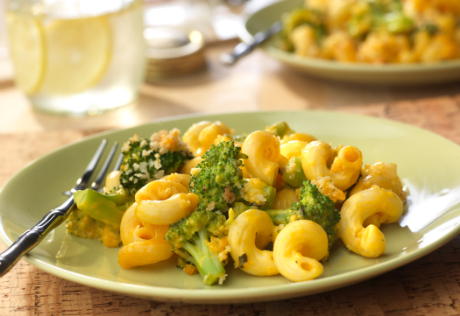 Broccoli, pasta, shredded Cheddar and a creamy cheese sauce are combined and topped with a tasty bread crumb mixture. It’s a family-friendly dish that’s a guaranteed winner! Heat the oven to 350°F. Spray a 11 x 7 x 2-inch baking dish with vegetable cooking spray. Prepare the pasta according to the package directions in a 3-quart saucepan. Add the broccoli during the last 3 minutes of cooking time. Drain the pasta mixture well in a colander, reserving 1/2 cup cooking liquid. Return the pasta mixture to the saucepan. Stir in the cheese sauce, 1/2 cup cheese, black pepper and reserved cooking liquid and toss to coat. Pour the pasta mixture into the baking dish. Stir the bread crumbs, remaining cheese and butter in a small bowl. Sprinkle the bread crumb mixture over the pasta mixture. Bake for 20 minutes or until the mixture is hot and bubbling. HERO TUESDAYS MAKE YOU THE HERO OF THE DINNER TABLE. 5 minutes of prep time is all you need to be a hero with this recipe featuring ready-made meatballs, Prego® sauce, and mozzarella cheese.